Like everything else in this world, our hair have a certain cycle of growth and decay. 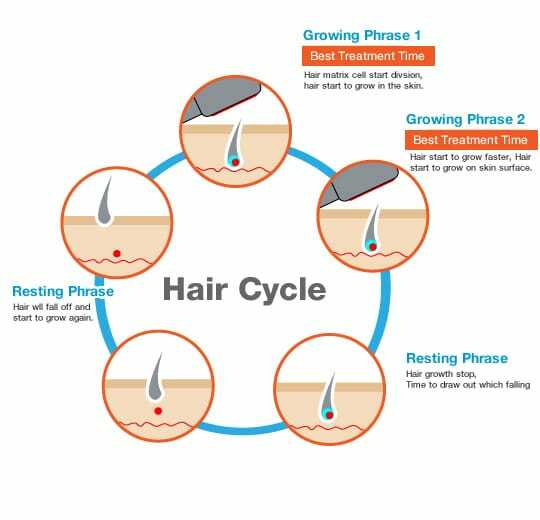 The cycle which helps us understand how the hair grow on our head and how they fall out, for each day we go through this process of hair transformation and are completely unaware of the same. This is a normal routine and nothing alarming. The hair on the head grow out of follicles, there are lakhs of follicles on our head which are the reason to a full head, but the texture and growth patterns of each type of hair is different depending upon the genetics, age factors, health condition and other factors. The first stage is the Anagen stage, this stage lasts for about 4-5 years. In this stage there are about 90% hairs in active growth stage. The pigment that the hair bears is also developed in the hair in this stage. The second stage is the Catagen stage of hair growth which lasts for about 3-4 weeks only. In this stage the hair follicle stops producing melanin because of which the hair growth stops and the hair follicle is reduced to one sixth its normal length. The final stage of hair growth is the Telogen phase, which lasts about 2-3 months after which the cycle repeats itself again. This stage is basically the resting stage of the hair were they tend to fall out of the head by means of shampooing, oil massages, combing etc. these hair that are shed form about 14% of the total hair volume. The hair in this stage falls out only to make place for the new hair again.